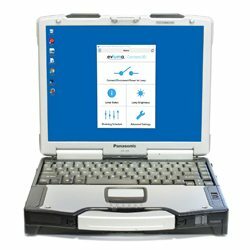 New release of Bluetooth Windows LED lighting controls with field-friendly, touchscreen-enabled interface, Dim-to-Off capability and cloud-based site license saves utilities and municipalities on lighting maintenance. 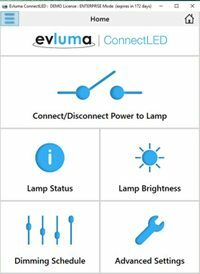 LED lighting manufacturer and applications developer Evluma announces a new release of ConnectLED for Windows. The updated Windows application boasts a refreshed, intuitive interface for the easy management of Evluma’s outdoor lighting product lines AreaMax and OmniMax. ConnectLED uses Bluetooth Low Energy (BLE) to wirelessly communicate with installed LED lights at a distance of up to 150 ft. reducing maintenance time and costs. The app is also available for Android tablets and Apple iPhones and iPads. Simultaneous to the new Windows release, Evluma will update all versions of ConnectLED with new Dim-to-Off programming. Dim-to-Off programing enables utilities to shut off lights altogether at a designated time or for a short time period. Evluma released the first version of ConnectLED in 2013. As its popularity grew, customer feedback helped to shape the mature outdoor lighting application. Administrators can easily manage permissions and updates using the new cloud-based, Site License structure implemented in 2017. For new customers looking to explore the benefits of Evluma lighting, a ConnectLED PROMO license is included with AreaMax and OmniMax LED lighting pilot promotions. Some restrictions may apply. Visit Evluma booth #407 at TechAdvantage, Nashville, TN, Feb 25-28th for an interactive ConnectLED demonstration.